Fritz Lang's epic adaptation of Die Nibelungen is five hours of ridiculous nonsense. But, my word, is it impressively ridiculous nonsense. The all-encompassing grandeur and sweep of the story towers over any modern day fantasy. If anything, this remastered edition most closely resembles Star Wars, as pre-imagined by Tolkien. 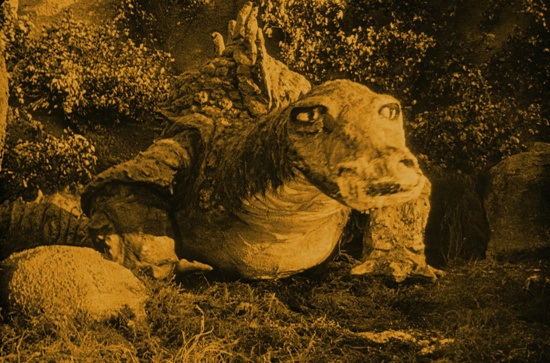 The tale itself dates from the 13th century, and the sepia-bordering-on-jaundiced tones of the film version suggests this was made around the same time. However, Lang completed his vision in 1924, originally releasing it in two parts. The first focused upon Siegfried (Paul Richter), our dashing, musclebound He-Man hero, who busies himself living in a mountain. Having manufactured a series of swords with his friends - who, judging by their warped faces, appear to be perpetually in the throes of a meth binge - he slays a dragon and bathes in its blood, thus granting himself invincibility. Aided and abetted by this infinite bravado, Siegfried marries the ostensibly beautiful, virtuous and wondrous Kriemhild (Margarete Schön). 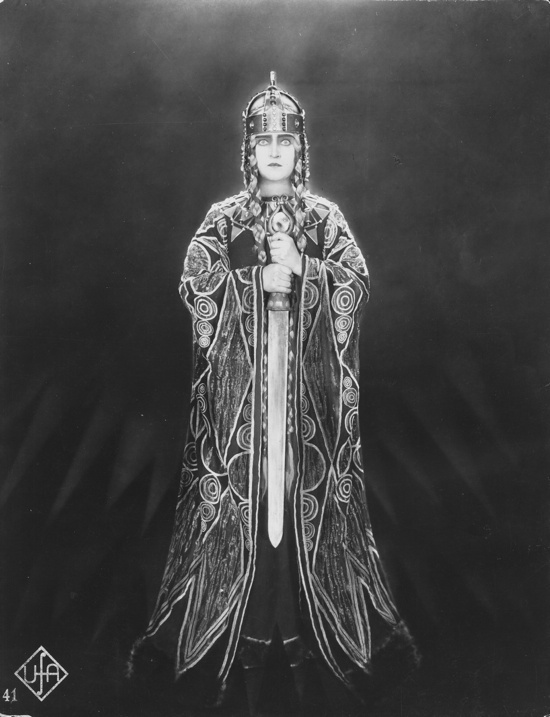 Alas, his boisterous attempts at arranging the marriage of Kriemhild's brother King Gunther (Theodor Loos) to the warrior Brunhild (Hanna Ralph) causes untold havoc and chaos among the in-laws and beyond. The second part sees Kriemhild revealed as a true n'er do well, moving to the Far East, marrying Attila the Hun and plotting ruthless revenge against those who have done her wrong. The simple fact that Lang succeeded in translating this to the big screen is remarkable in itself. His directorial approach is heavily stylised, especially in the first part, which is all angles and arcades, abstracts and anomalies – curiously resembling a shrill misé-en-scene, or what can only be described as an Expressionist hangover. The director solders the tenets of architecture onto his characters; they become part of the décor, creating an often industrial and contrapuntal arrangement of actors amid the woodland landscapes. With all these visual slants and geometrics, it's a wonder that the protagonists do not reach out and poke the viewer right in the eye. But the Siegfried character ultimately reveals himself as one worthy of pity and sympathy. Lang portrays him as the classic tragic hero who opposes the world and prevents it from stagnating. His defeat is inevitable but by no means senseless. Kriemhild also opposes the world actively, by seeking revenge, but through purely nefarious means and therefore becomes guilty herself. However, it's impossible to avoid the fascistic baggage that accompanies Die Nibelungen. The movie was loved by Hitler and Goebbels – its opening credits display a dedication "for the German people" – and the first half was re-released in 1933 with a spoken prologue and Wagnerian soundtrack. Presumably, the final subsidence for the duration of part two into a cycle of demented bedlam and rampant nihilism was out of bounds for a Nazi government eager to derive a propagandist doctrine from Lang's work. Almost one hundred years on, any attempts to tease nationalist rhetoric from this movie is completely undermined by its tapestry of hieroglyphics. The pictorial overwhelms the dramatic – in fact, Die Nibelungen now probably makes a better still than film. There's an art-for-art's sake decadence here, which Lang captures in unmistakably physical terms. One can argue that if Hitler and his ilk viewed Die Nibelungen as prefiguring the rise of the übermensch, Lang, by virtue of the thrilling end-piece siege and denouement, equally foretold their downfall. While Lang's later Metropolis (1927) and M (1931) might be, respectively, his most fêted and most cinematic pictures, Die Nibelungen works best viewed as a period curio and pivotal vestige in both Lang's development as an auteur and within the wider development of film in the silent era. The feature was produced on a scale unparalleled in the history of German cinema and, perhaps unsurprisingly, Alfred Hitchcock was a visitor to the lot at the completion of production. The reckless flaunting of architectural excess, through gigantic medieval castles and complete prehistoric forests made entirely of concrete, is still stunning in terms of style and ideological ambition. While the acting and plot construction may not have aged well, the film still manages to offer a fascinating and complex contribution to 1920s discourse on modernity. Lang, who once described Die Nibelungen as a "Western for the European", weds the story's key themes – fate, murder, revenge – to some of the most functional compositions in cinema. Die Nibelungen is out now on Blu-ray and DVD via Masters of Cinema/Eureka Entertainment.